Efficiently Convert Outlook PST files to MBOX files. Installation of MS Outlook required for PST to MBOX Migration. No File Size Limitation To Convert any Size of PST Files. Option to create a single MBOX file for each PST Mail Folder. Option to Export selected PST files. 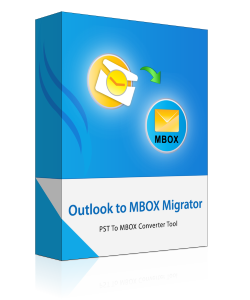 The tool enables to migrate all emails from an Outlook PST to MBOX mailbox. At a time only one PST file can be converted and a only single MBOX is created for the same. Also, the tool will export the entire folder of PST mailbox along with their email item such as Inbox, Outbox, sent items, Drafts, etc. The Outlook to Thunderbird migration tool support, the option to maintain the folder hierarchy of email files. In case user wishes to preserve folder hierarchy, then choose "Yes " option else if they don't want to maintain the folder hierarchy structure then they can go for "No" option. As soon as you load the Outlook PST files, user only needs to click the export option to easily convert PST data to MBOX files. After the complete conversion of PST to MBOX it will show you the intact data count for each folder. It will preview the name of the current folder along with its folder count and the number of emails converted. Once MS Outlook to Thunderbird migration is completed, the software will maintain the data integrity which retains the metadata associated with emails like: sent data, received data, too, Cc, Bcc, etc. as well as it maintains the original formatting of emails the crucial data in it. For user ease the tool facilitates the single panel for the file selection, conversion & status of the conversion. Migration of PST Files to MBOX on a single panel of software makes the conversion procession so easy, fast, understandable, and comfortable for all types of user. After the conversion, the software creates a new MBOX format file for post conversion and these files are easily exported into all compatible desktop email clients. With the use of Outlook to MBOX converter tool user does not need to worry with the compatibility issues because the software can easily export output MBOX file for number emails client such as Thunderbird, Eudora, Apple Mail, etc. Demo version of outlook to mbox converter software allows converting and saving first 15 emails from PST to MBOX file format. Can I export pst to thunderbird without outlook on my PC? No, Outlook installation is necessary for using the software to import pst file to mbox. Is it possible to convert corrupt or password protected PST files into MBOX? No, tool will not convert corrupt or a password protected PST file. After testing convert pst to thunderbird software I can say that now I do not have to face any problem while converting Outlook to Thunderbird files. The effort by developer really appreciable and I must say a big thanks to Revove Groups for understating the actual need of lay user. It was always seem that now days there is a great change in the means of email communication. Earlier I am restricted to use MS Outlook but with the use of fantastic software. I can easily import mail from outlook to thunderbird and it also made possible to use my mailbox files on a number of email client without any compatibility issues.